How Maharaja Jai Singh used scale to build and enhance the accuracy of his giant astronomical sundials. In 1727, a great Indian Maharaja founded a new city, which bore his name. Jaipur was planned and built by Jai Singh II, a mathematician, astronomer and king with a passion for science and knowledge. Well-educated and highly intellectual, he was only 11 when he started to rule his land. Believing that he was descended from the Sun, Jai Singh sought to unravel the mysteries of the heavens. He wanted to do this more accurately than anyone before him. So he set about building a series of enormous observatories. Jai Singh built his biggest observatory in his own city of Jaipur. 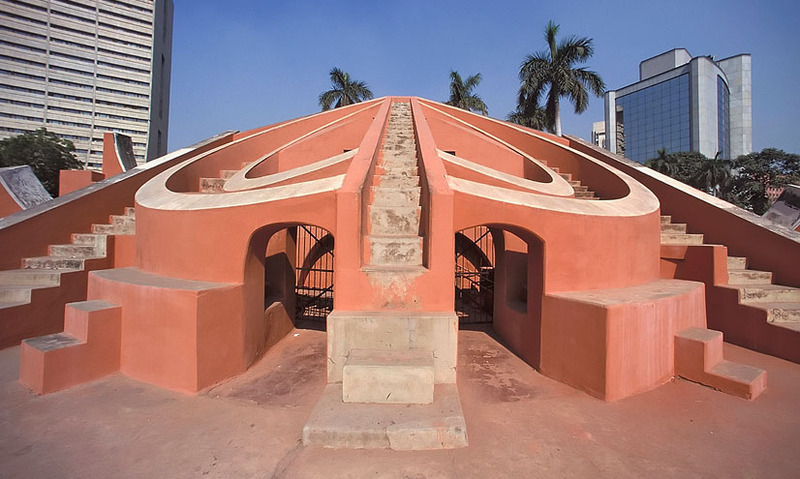 The Jantar Mantar, contains nine huge instruments made from stone and marble. At 27 metres tall, the Samrat Yantra dominates the landscape. It is the world's largest sundial and measures time with its shadow. Jai Singh had observed European instruments, and knew that their size affected their accuracy. He built the Samra Yantra on such a large scale so that the shadow cast would be longer, providing the most detailed measurements in the world. Every hour the shadow cast by the dial moves approximately 3.6 metres. If an instrument was half this size, every hour the shadow would move only 1.8 metres, reducing the accuracy by half. By increasing the scale, Jai Singh's sundial had enhanced accuracy. Its shadow moves 6 centimetres every minute. The 6 centimetres are divided into 30 equal parts. So the sundial tells the time accurate to around two seconds. In the 18th century, measurements were observed with the naked eye, so this new level of accuracy was a crucial advancement. It allowed astronomers to forecast the arrival of eclipses and monsoons. 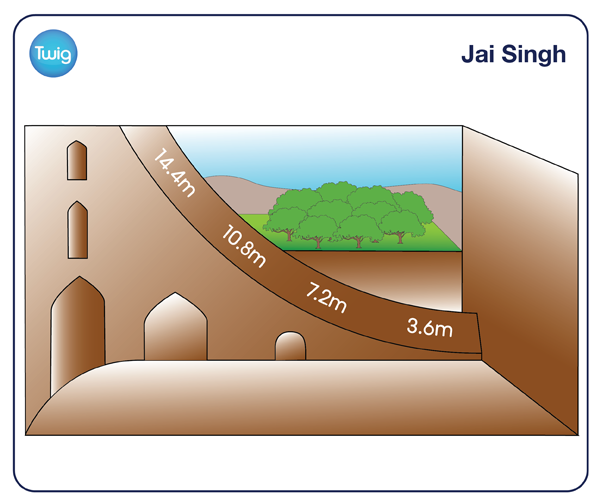 And ensured Jai Singh would be remembered for his extraordinary engineering and astronomical instruments.